Since the debut of our first Christmas cards almost one year ago, we have been pleased and humbled by the fantastic response to cards which combine beautiful, unique works of art with a clear confession of our Savior’s birth. 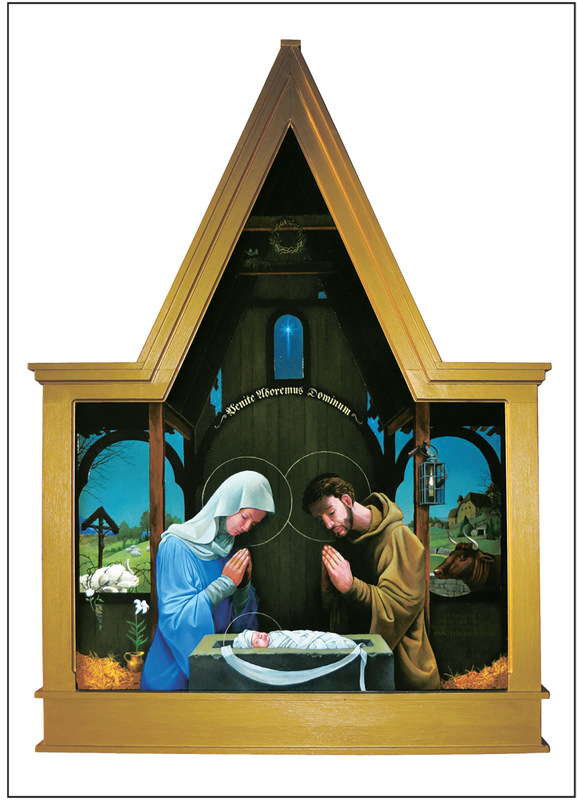 This year we are thrilled to offer two new Christmas cards with artwork by Edward Riojas, an artist whose work is also included in The Brotherhood Prayer Book and on several of our greeting cards and book covers. His sacred work can also be found in private collections and sanctuaries throughout the U.S. and Canada and in numerous Lutheran publications. The first card, Adoremus, features a seven foot tall oil painting on wood originally created as an entry for ArtPrize 2012. There is much symbolism in the details: the lily, which is a symbol of the Virgin Mary; the carpenter’s tool next to the lantern with a single burning light, representing Christ as the Light of the world; the eight-pointed Bethlehem star which announces Christ’s birth but also alludes to His death by its cross shape; the crown of thorns that literally hangs over Jesus’ head; and the inn with smoke intentionally excluded from the chimney, showing a lack of hospitality. The inside text reflects the Latin included in the piece (Venite Adoremus Dominum): Word of the Father Now in flesh appearing. O come, let us adore Him. The second card, Virgin and Child, features an oil painting on wood in the artist’s personal collection. 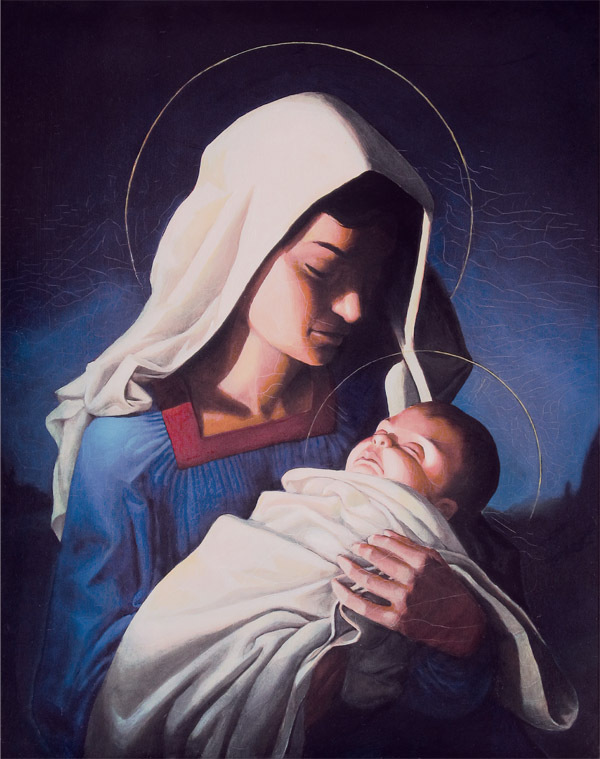 Riojas used his daughter as a model for the Virgin Mary, depicting the solemn and holy night of our Lord’s birth. The inside text proclaims Isaiah’s words of prophesy: For to us a child is born, to us a Son is given…and his name shall be called Wonderful Counselor, Mighty God, Everlasting Father, Prince of Peace. Like our other Christmas cards, these cards are 5″ x 7″ with classic gold foil-lined envelopes. Also be sure to take a look at our other ecclesiastical greeting cards, including gorgeous fresco and stained glass cards as well as Baptism, Easter, and other Christmas cards. This entry was posted in Latest News and tagged Adoremus, Christmas cards, EP Cards, Virgin and Child. Bookmark the permalink.